Zeroing in on the game's most important element: art. he first in a series of articles dedicated to covering art and story in video games, this feature is all about Brütal Legend, the new game created by Tim Schafer's Double Fine studios. Brütal Legend features some fantastic voice work by Jack Black of Tenacious D (not to be confused with that other guy who tries to act in movies sometimes), Tim Curry, great cameo appearances by metal gods such as Ozzy Osbourne and Lemmy, and breathtaking visuals that could've been ripped straight out of the pages of the heavy metal bible, were there such a thing. The game is an interesting blend of action adventure, RPG, Twisted Metal-style driving combat, and RTS elements that, for the most part, really works. If you want a more traditional review of the game, keep reading Game and Player. This article is going to zero in on and explore in detail one of the biggest and most important elements of Brütal Legend: the art. First and foremost, Brütal Legend is a tribute to heavy metal. 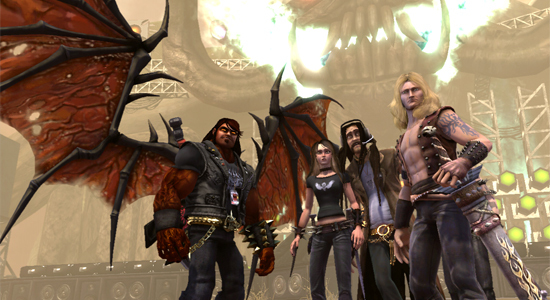 Not only is a tribute to the music, which is carried out primarily through the game's storyline; it is also a tribute to the art of heavy metal. Fire, metal, stone, blood, chrome, rubber, lightning, smoke, long hair, bandanas, denim, leather, and spikes . . . these are the defining visuals of heavy metal, and these are what the characters, landscapes, and equipment in Brütal Legend are made of. Brutal Legend is a tribute to heavy metal: the defining visuals of heavy metal are what its characters, landscapes, and equipment are made of.The visuals in Brütal Legend are absolutely fantastic, and Double Fine's dedication to crafting a world that serves as a living, three-dimensional, interactive homage to the universe of Heavy metal is unquestionable. Characters roam around in leather vests and spiked bracers, with long, flowing hair straight out of a Viking novel. Giant stone swords jut out of the landscape, right alongside huge sculptures of guitars. Cliff sides are made of giant, shattered engines; and enormous stage lights in the sky highlight your next mission objective. I think that, more than in any other way, crafting a world that pays tribute to heavy metal at every turn is Brütal Legend's greatest success. If you've ever bought or been tempted to buy an album based solely on the wicked chrome fire breathing dragon on the cover, you're going to love running, driving, or fighting in Double Fine's Brütal World. The palette of Brütal Legend is perfect; the world is constructed from glistening chrome, leopard print, fire galore, and every shade of red you could imagine bursting forth from a bad guy's corpse. The landscape is vibrant and alive, and it really makes you want to get out and explore. The art team at Double Fine could have went with more subdued colors, painting a softer, gentler landscape, but that isn't the case here. The hills may be green; but they're an aggressive, sharp, fast shade of green that almost makes the grass seem loud. Everything in Brütal Legend begs to be seen, investigated, and appreciated, and the visuals do a fantastic job of conveying the kind of emotion and sensation that the environment should possess. The jungle seems wet, humid, and dangerous; the dry ice quarry cold, quiet, and painful to touch. What struck me most about the landscapes was that nothing was boring or average; everything is juiced up and badass. Upon first glance, a cactus was just a regular old cactus; but after a little inspection I realized that it actually had a chrome exhaust pipe growing out of it. In the graveyard there aren't flowers on top of the graves but rather offerings of beer, which break if you drive or walk over them. Once in a while you'll see graffiti on the walls championing the game's big hero, Lars. Oftentimes, in little crevices or around the bases of things you'll find stage lights, growing out of the ground like flowers, which illuminate the world at night with tiny swaths of reds, blues, and greens. These things aren't easy to spot, and indeed many people will probably play through the game without noticing them, but they add just a little bit of light, personality, and style to the world, which makes it just a tiny bit better. Omitting them from the game wouldn't have had very much consequence, and I'm sure the team at Double Fine had bigger things to work on; but Double Fine didn't omit them. They're in there, and that's the kind of attention to detail that makes the Brütal World amazing to see. You'll associate some of the world's best metal songs with some of the game's best moments.Brütal Legend's fantastic visuals have a way of sneaking up on you. The first time you see the telltale red flowers around a relic or Motor Forge you might not think anything of them; but when you realize that the petals are each a little red hand throwing the devil horns, you can't help but smile. Likewise, the first time you raise a Motor Forge and you see the wicked, winged skull spread its metal wings above the door, you're apt to get goose bumps. Go ahead and drive into the Motor Forge. When you get down below, you'll find yourself in a world of hazy oranges and reds, with building sized Titans lumbering away at the molten rock. Seeing the Titans tirelessly work inside the Motor Forge was one of the things that really sold me on the game. You can't interact with them at all, or even get close to them. They offer absolutely nothing in terms of gameplay, but they're there. These are the kinds of details that I really appreciate. The fact that Ozzy jumps out of the lava and offers to customize your gear doesn't hurt, either. Even the upgrades are cool to look at. If you buy the chain lightning treatment for your axe, it crackles and pulses with energy, a lot like a Mongoose enchant in World of Warcraft. Other treatments have similarly apt effects, as do the guitar strings. Upgraded armor means bigger and badder armor plates. New weapons mean, well, new weapons attached to your car. If it can be represented visually in Brütal Legend, it is, and it's done well. They never skimp. Another big part of the art in Brütal Legend is the mythos of the Brütal World. There are 13 legend statues in all which have to be discovered and unearthed throughout the Brütal World, and each time you access one you're treated to a small part of the world's mythology. By the time you've peered into the final legend statue, you're caught up chronologically and the stage is set for the events you're currently playing through in the game. Accompanying each narrative is a huge illustration that depicts the story you just heard. The best way I can describe them is that they're like heavy metal cave etchings; they're done in black and white and they're very basic, with thick, hard lines and sharp angles. They're really cool to look at, and I kind of want to hang them on my walls. During my time playing through the game's main story, I neglected to find a few of these legends in the interest of moving forward and finishing the game. Once I was done with the campaign proper, I had to go find the rest. I wanted to see the remaining drawings and hear the remaining parts of the mythology. It wasn't just about completing the attached achievement. This had nothing do with my GamerScore, or a general sense of completion. I genuinely wanted to see them. In my opinion that's rare, especially in today's video games that are littered with achievement-yielding collectables that, for the most part, I don't really care about. Did Double Fine have to put these doodads in the game? Certainly not. Do they make a big difference in terms of power-ups or playability? Not really. Are they really cool? Absolutely, and I wasn't satisfied with Brütal Legend until I found all of them. If I drive by a landmark that I'm particularly fond of, I'll stop and jump out of my tricked-out Druid Plow just to look at it again, even though I've already collected the fire tributes. That, to me, speaks volumes about how stunning the visuals are in this game. And, of course, there's the music. This is just as much a part of the art of Brütal Legend as the visuals, and Brütal Legend hits another home run here as well. One of the best parts about the later installments in the Grand Theft Auto series is the selection of music to fit with the themes of those games. My favorite of all of them is Vice City, with its thoroughly 80s soundtrack. Michael Jackson will forever remind of Tommy Vercetti because of that game. Brütal Legend has taken this idea and amplified it even further, hitting you with both classic and contemporary metal songs at every turn. After playing through this game, you're probably going to associate some of the world's best metal songs with some of the game's best and most meaningful moments. Metalheads and headbangers rejoice; you won't hear any Linkin Park or Papa Roach coming from your speakers, and you'll be ecstatic when you watch the pop-metal bashing movie at the beginning of the game. Peter McConnell did a fantastic job filling in the blanks between the pre-recorded metal songs.The original score for Brütal Legend is outstanding, and really sets the mood in the times when you aren't listening to the radio (or the "Mouth of Metal" as the game calls it). Peter McConnell did a fantastic job filling in the blanks between the pre-recorded metal songs. But because a large part of the game is spent in your car, you do listen to the radio quite a bit; and it's way better than any station you're going to find in the real world. All the big names from the "golden age of metal," traditionally categorized as the 70s and 80s, are here: Black Sabbath and Ozzy Osbourne, Motörhead, Megadeath, Slayer, Judas Priest. But there's quite a bit of newer stuff as well. Rob Zombie, Dragonforce, Dethklok, Marilyn Manson, and yes, Tenacious D, are all featured in the game, and they fit in very well. The game also employs famous songs periodically throughout the story, and there were a few times where I was particularly moved by Double Fine's choice of music. There is a scene involving Ophelia later on in the game that makes use of Ozzy Osbourne's "Mr. Crowley" which has reignited my love for that song in a major way. I won't spoil it for anyone, but it rules. If Brütal Legend succeeds as a video game, it's going to do so not because of any groundbreaking mechanics or gameplay concepts, but because it takes a tried-and-true formula and excels in the presentation. None of its gameplay elements are "best in class." The RTS elements just don't have the depth or polish of Company of Heroes or Warcraft. But Warcraft didn't get to be one of the biggest franchises in the gaming world just by having solid mechanics; it also got there because it's awesome to look at. Brütal Legend is the same way. It just oozes color, vibrancy, and fun from every pore, and the more you explore the game, the more impressed you're going to be. If you already had a love affair with heavy metal, Brütal Legend is just going to solidify it. But if you're like me and you hadn't yet experienced heavy metal, you might find yourself Googling album covers or buying some new music when you're finished with your 360 or PS3. That to me, coupled with the fact that I had a lot of fun playing it, signifies that Brütal Legend is a successful video game. The game has had me grinning while playing. The art direction is spot on, filling the world with metal iconography and poking fun at the macho, fantastical demon obsessed aesthetic while maintaining total reverence. I think much would be lost on those who were not fans of the genre, but for those that were part of that scene, it's a masterful peice of fan service. And the soundtrack is perfect. I find our appreciation of metal and related, mostly 80s aesthetics, to alternate between mockery and furtive awe. All that imagery is so ridiculous, and we wouldn't be caught dead seriously creating it, but when we're asked what we think, our word of choice is, indeed, "awesome." Wow, Jace! Great article, bud. The Brutal elements you've picked up on make the game -- they are the game. I still can't believe an experience like this exists. As for the little red-petals: I didn't notice the secret imagery. You're inspiring me to slow down and smell the devil horns.